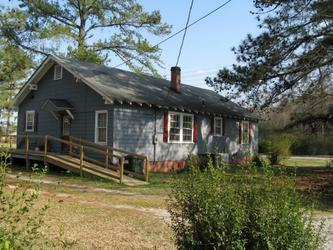 In the photo above, you can see the back of the house on West Mount Drive in Rocky Mount, N.C. where Jack Kerouac spent several months in early 1956. He lived there with his sister, Caroline, or Nin, and her husband, Paul Blake. It's only through the dedication of John J Dorfner of Raleigh, N.C., that we know about this house. In the early 1980s, after moving to the state with his wife, he became obsessed with knowing more about Kerouac's time in Rocky Mount. Understand, nowhere did any biographer mention the possible location of the house. That's why when I made a similar search about the same time, I came up empty handed. I was working at my first newspaper job in 1986 and heard from another writer that Kerouac had spent time in Rocky Mount. I figured it was a rumor really, and thought little of it. Then, I read a column by another reporter, Cindy Trew, who wrote about tracking down the house in "Big Easonburg Woods." I was very touched by her column; she was a fine writer. So I trekked to Braswell Memorial Library, looked through the North Carolina collection. Nothing. I drove around in Little Easonburg, which is just west of town on Sunset Avenue. Nothing. Then in the late 1990s, curious again, I went to Braswell Library. By this time, Mr. Dorfner had published his slim, but dense, volume, Kerouac: Visions of Rocky Mount. There were photos inside and I drove along West Mount Drive until I found the house. It is pictured above. Good sleuthing all around. Didn't you say, in an earlier posting, that Kerouac slept on a back porch? If so, looks like the porch has been removed. What is so fascinating about the homes (however briefly) of the famous? Do we hope some of their creative dust will rub off on us? Do we like to experience the scale on which they lived? Does it simply humanize them, bring them down to our size a bit? For me, going to the homes of writers I love allows me to feel closer to them. It's become almost like meeting them, but without having to be disappointed by their imperfections. No, a house gives us feelings, impressions and the possibility of breathing the same air as another person, long dead. Some might call them ghosts. I'll never forget the visits I've made to the homes of Edgar Allen Poe in Richmond; Flannery O'Conner in Savannah; and Thomas Wolfe in Asheville, just weeks before an arsonist burned it. Visiting Proust's summer home in Illiers, France, portrayed as Combray in his novels, was one of my most moving experiences. Just found RM mentioned in an excerpt of "Maggie Cassidy" (1959) on page 88 of the "Portable Kerouac" ... "Saturday night is dense and tragic in all America from Rocky Mount on up, San Luis on over, Killdeer on down, Lowell on in." Anybody know if RM is mentioned elsewhere in JK's work? yes, Kerouac writes about Rocky Mount, On the Road, calling the town Testament. he also talks about Rocky Mount in Visions of Cody, The Dharma Bums, Pic, and many more books. i'll write again with the complete list. glad to see interest in this topic. Thanks for the input! Just dipping my toes into Kerouac for the first time. This info makes me all the more eager to read his work. Apologies for the late reply. Vacation and Net problems ... blah blah blah.